Riding and hiking have different considerations for obvious reasons, and the design of footwear is where it is most noticeable. Hiking usually asks for breathability and light weight while needing a burly tread pattern and an all-day-comfort footbed. Motorcycling asks for protection and a seamless transition from the boot’s chassis (upper) to its sole, with feedback and feel being very important features. And the same problems are tackled in different ways between the two designs; even if a moto-boot needs breathability, it is designed to breathe at 50mph, not at walking pace. It is quite simple: different demands require different designs. What is not simple is that motorcycle travel means you should carry as few items as possible while still getting the job done and being able to surmount small setbacks. I have looked at several footwear options and still have not arrived at a “shut up and take my money” solution. 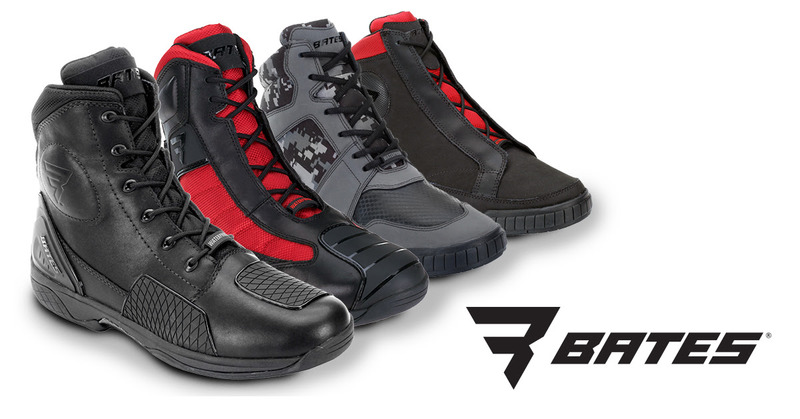 Bates Footwear raises my eyebrow with their brand new (technically a year old) leap into powersports. Because I’ve already spent long hours marching and standing formation in Bates boots and dress shoes while in the Marines and then Army, I trust them explicitly. However, they did not specifically design the Taser or their other moto-boots to be day-hikers. One keen look shows they are designed to work on the bike and on the street, but the Adrenaline and Beltline do boast tread patterns that could handle moderate trail work. 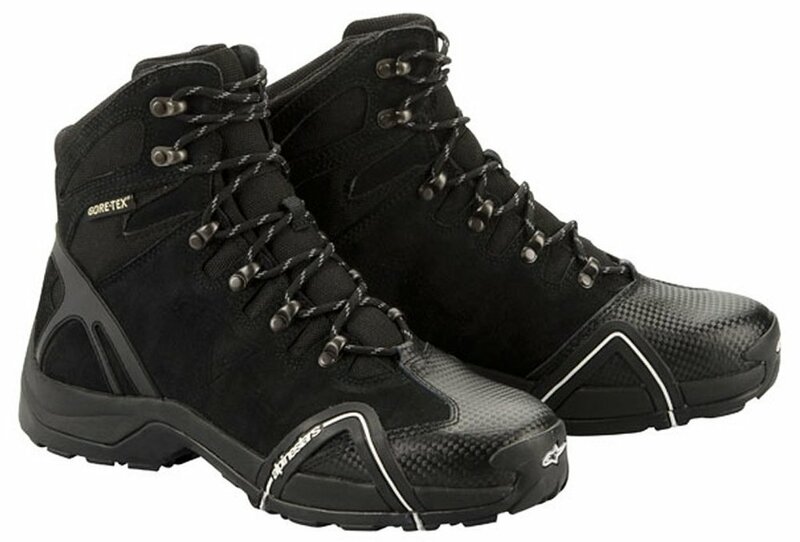 Some dual sport riders tout Alt-Berg boots or Kochmans but these are not sold in the US and therefore become unattractive options for the budget-minded traveler. My usual solution to the ride/hike dilemma was to use my old military-issue hot weather boots, but the blocky tread, reinforced toe, and complete lack of crash protection made them a poor compromise. Using ultra-expensive boots that have to be ordered from dealers in another continent can’t really hold my attention because I’m too busy clutching my wallet fearfully. Alt-Bergs are not sold in the US anymore. Alt-Berg is popular with European long-distance riders. Kochman is also no longer available in the US . On that note, tactical boots at least cover some of the bases while ranging in price from stupid-cheap knock offs to ultra-expensive symbols of insecure masculinity. Since these boots are meant for less abusive work than forced marches and digging a fighting position they can be noticeably lighter, with less blocky treads and zip-up sides. If you aren’t going to have decent ankle protection on the motorcycle, might as well make it easier for the paramedics to get them off. However, these boots are designed neither for long hikes nor are they meant for motorcycling; a shady compromise at best. Tactical boots offer many designs, treads, heights, and some are actually not black. Tread patterns & sole stiffness can make tactical boots hard to use on the road. Established brands used to offer some solutions to this dilemma but they do not seem to be big sellers. Alpinestars has had the CR-4 boot for years but I do not know a single person who has owned a pair. They are also no longer produced. Forma has what amounts to a mid-length motocross boot. Hard to know if it would work on a day-hike until you’ve already spent over two hundred smackers. My personal solution is not a solution. 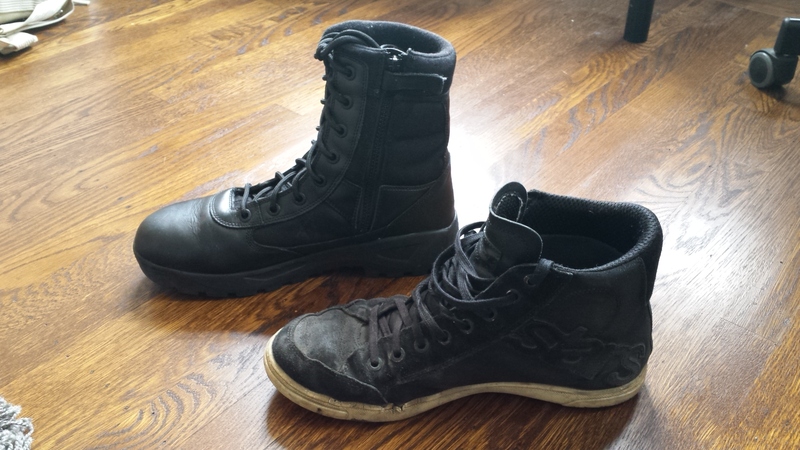 Frustrated by the difficulty shifting gears in my old combat boots (not to mention the lack of any ankle protection or support), I usually wear a dilapidated pair of Alpinestars Joey waterproof shoes, mainly because they are two-and-a-half years old and I don’t care what happens to them. Being for city use, there was never much tread on them and at this point there isn’t any tread to speak of; not fun on anything but the most well groomed and dry trails. I also have a super-cheap pair of tactical boots but they suffer not only the maladies of being cheap but they also offer little protection. At least shifting gears with them is easier than my old combat boots. My Alpinestars Joey WP shoes have paid for themselves over and over but they are not good hiking shoes. Tactical boots are a meek compromise at best. Because I find additional footwear to be the most frivolous of investments when packing for a motorcycle trip, I’ve been searching for a compromise that can handle both on and off bike duties… and at a respectable price. It seems impossible so I wonder: do any of you have any ideas? Have you come across any boots that work great on the bike and walking the trail as well? Share your insight and thoughts in the comments section. Let’s see what kind of good solutions are out there. I’d like to know more options, too! I wore out the soles on 3 pairs of TCX X-Street Waterproof Motorcycle Boots in 2 years for motorcycle training, but they probably don’t have a beefy- enough tread to hike. I love LOVE my Sidi “On- Road” Gore-Tex on the bike, and totally can handle rain, but a bit too stiff for a serious walk, but I’ll wear them around the racetracks after riding to the track (mostly I’m sitting at the track, watching!). I am currently breaking in some Bates Gore-Tex Tactical for work. The Bates are truly waterproof, but not the type of protection I want for riding. I’m watching Red Wing carefully, as they have some moto boots coming out, and I’ve work through a half dozen Red Wings in my time at my manufacturing jobs back in the day that required steel-toed, chemical-resistant-safety shoes. Side note: I always buy men’s boots now, because they last longer and are heavier-duty than the women’s equivalent. That’s interesting about the men’s vs. women’s boots. It makes sense but I never would have thought of it. Currently the Bates powersports stuff looks the best but I usually don’t go past $150 unless it’s for a racing application. Definitely I would not hike in my X-Street TCX’s; they are surprisingly stiff and there is basically no tread. The Joey’s I use literally have no tread now (after 2.5 years of use) but they are the best option I currently have. The tactical boots I got at $29 so you can imagine they will not only wear out quickly, but burn up my heels after a few miles on the trail.